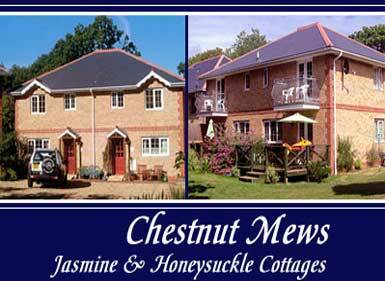 Chestnut Mews Self Catering Holiday Cottages are situated in the beautiful Old Village of Shanklin on the Isle of Wight. Our 3 bedroom cottages offer a very high standard of spacious, fully equipped accommodation. Tucked away from the main road and nestled within a delightful sylvan setting with half an acre of sheltered, secluded gardens, Chestnut Mews offers a peaceful and relaxing base with which to explore the alluring Isle of Wight. The Island is teaming with wildlife and the famous Island Red Squirrels are often spotted around the grounds of Chestnut Mews. While you are here, why not give the car a rest! The cottages are ideally situated for exploring stunning coastal and country walks, some of which begin at the end of our driveway. The cliff path and steps leading to the lovely sandy Appley Beach is approximately 10 minutes walk through Rhylstone Gardens with its crazy golf, café and band stand. Both Jasmine & Honeysuckle cottage sleep 5 + 1 (to include cot) with 3 bedrooms. The master double has an en-suite shower and balcony. There is a twin bedded room and a single with 3' bed and roll-out under bed. There is a family bathroom and downstairs toilet. Downstairs is open plan with spacious kitchen / diner and lounge. French doors lead onto a enclosed decked patio, which overlooks the private gardens and childrens play area. Our cottages offer spacious accommodation fully equipped to a very high standard. To include: Colour TV, video, CD and DVD Player, fridge/freezer, microwave, vacuum cleaner, iron & ironing board, cots, highchairs and barbeque. There is a secure locking shed available for bikes and equipment. Each cottage has dishwasher, washing machine, hairdryer, clock-radios and free to view SKY Channels.